The Foundation StrayCoCo engages in countries where there are huge dog populations, which are treated cruelly. We are active where no other big animal welfare organisation is caring for the dogs. Together, with willing authorities and private persons, we will take care of stray dogs; there are many thousands that need help - as well as the citizens who have to spent their life with contagious stray dogs that sometimes are even dangerous, specially for children! Our aim is it to create lasting projects with locals, politicians, vets, volunteers and other support organisations. We know it is a long and expensive mission, but together we can do it! We are all animal lovers and are willing to spend our money and time to improve their wellbeing. At the core of our efforts is the plight of the stray dog, as we notice - and you might too - the endemic growth of stray dogs worldwide. We choose to do something about it. We understand cats have no better fate, but we have decided to focus on dogs for now, as our resources are limited. Also, cats are not as dependent on humans as dogs are, as the domestic relationship with man has been forged over thousands of years. This can be seen simply by dogs returning to humans even after being hurt or tortured. We wish that each dog will find his master, but if they do not, and are forced to live on the streets, we want them to be able to do so without living in fear of being hurt. We are convinced that there are ways for man and dog to live in peace together and to give each other support! We take care of the local people, who suffer under the enormous number of stray dogs, as they feel no longer safe - and it happens that small children are killed. The quality of life is much reduced in such municipalities.With CNVR we stop the increase of stray dogs and at the same time cure the dogs from diseases which might be contagious such as mange and rabies. We also give local veterinarians and helpers an income or additional income in the poorest country of Europe. We work in countries where there is a big stray dog problem and, up until now, no other large animal protection organization is already providing support or intervention - actually in Kosovo and Albania/Shkodër. We try to build strong connections with local authorities, and encourage them to stop whatever inhumane practices are taking place, such as locking dogs in a compound without shelter and starving them to death. We also build connections with locals, volunteers and other potential partner organizations. We give a job or an additional income to local veterinarians and helpers. We invest in education about dog behavior and basic needs, as we are convinced, that once people understand dogs, they will be less inclined to harm them out of fear, and shall also appreciate the needs of other animals too. Last but not least we will support scientific work focusing on the endemic increase of the stray dog population and development of solutions. Applications are welcome! 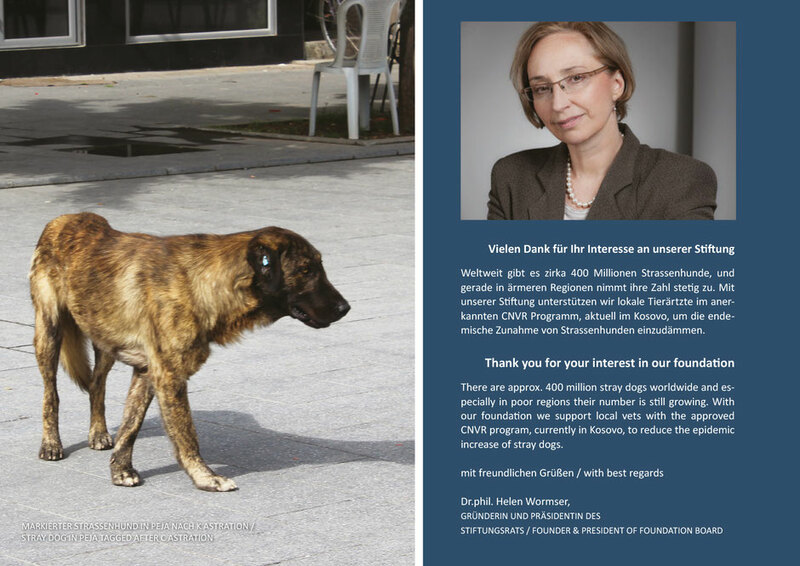 And most important: We try to push laws for registration of dog owners and breeders - as well as education. Dogs are not a waste product! So politicians must understand and change their citizens behaviour!